Mike grew up in Northern California, where he played many different sports. In high school he played football and baseball. It was then that Mike discovered strength training and found he truly enjoyed it. He then travelled some, intermittently working and attending college. During this period of time Mike began playing competitive rugby for Lewis and Clark College, Arizona State University and numerous men’s clubs. He was still very passionate about strength training and being fit, and read as much as he could to learn more. Mike then joined the Marines, where his passion for fitness grew exponentially. He realized that being physically fit and strong was essential for mission success where failure wasn’t an option. It was also at this time that Mike started to help others be fit and strong, and he realized that this was even more rewarding. While in the Marines, Mike eventually became an instructor at the Marine Combatant Dive Course, where he helped to develop the Physical Training Curriculum. It was also at this time that Mike discovered Crossfit. 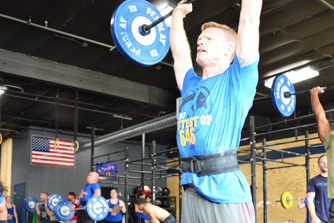 (Many, many) years later, he became a member of Crossfit 646 because his daughter wanted to “get strong.” Together Mike and his daughter found 646 and immediately were drawn to the sense of community among the members and the coaches. The coaches and members here truly care about each other! Mike knew that he wanted to be a part of this community and also be in a position to really help others. When he is not at the gym, Mike works as an Operations Analyst for the government.